With the girls away at college during Easter this year, Peter took me out to Fresco for Easter dinner. This was our first Easter dinner, just the two of us, and our first out at a restaurant, instead of making a special dinner (even a small one) at home. It was really fun. Peter and I are adjusting to our “empty-nest-hood” pretty well. We have great conversations…..with only a small part of them involving the girls! How. About .That! I wasn’t going to have dessert until the tray came around. 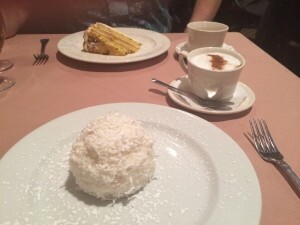 I can’t…..I REALLY can’t….resist coconut cake. This one was a coconut cake ball. So I had it with my first cup of coffee in 40 days…..a beautiful Italian cappuccino.